After 19 years, the Tennessee Titans made the decision to replace and upgrade their practice facility at Saint Thomas Sports Park. The original 70-foot high air structure had been in place for over 17 years and was exhibiting signs of failure. The biaxial cable system was vulnerable to storm conditions and the lighting and HVAC system was not up to par for an NFL facility. In 2016, a new air structure was successfully completed with 90 feet of space from ground to ceiling. The additional 20 feet of space offers greater versatility and enables them to suspend the goal posts and other items from the ceiling. The Titans feel the structure is a big improvement. The cable system reduces the fabric loads in all direction and the full bias net allows for increased structural rigidity during severe weather events, preventing swaying and possible collapse. The thermal value was increased from R-4 to R-8. The addition of an energy efficient HVAC unit enables them to maintain a temperature controlled environment that features automated controls to increase pressure during storm conditions. The dome specific LED lighting is bolstered by a skylight to provide natural lighting into the dome during the day to help conserve energy. 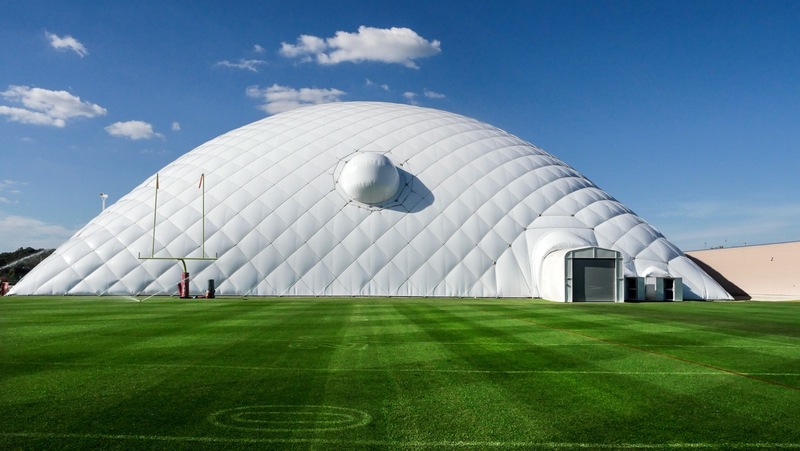 ASATI Air Structures, located in Rye Brook, NY, built this air structure. They have a long history with the NFL, having built 13 previous air structures. The fabric used for this structure is Seaman Corporation 8028 Opaque White, with 8028 translucent white skylight and bright white Tedlar®. This provides a long-lasting finish and keeps it cleaner and brighter by repelling dirt and debris.